Guitarist and composer Carl Filipiak has been bringing inventive playing to the Fusion world for years, this versatile, lyrical guitarist, has worked with some the best in the jazz fusion/rock world, like: Dennis Chambers, Victor Wooten, and Grammy nominee Bob Berg. He has just released a new album of hit sounds called, What Now. The group, Carl Filipiak and the Jimi Jazz Band, is comprised of: Frank Young on drums, Paul Hannah on saxophone and Matt Everhart on bass. With a guest appearance on two tracks by organist Brian Simms. The recording contains six original Filipiak tracks, and two covers, both instrumental versions of pop tunes, first, the Beatles’ “Strawberry Fields Forever” and second, Bobby Hebb’s R&B/soul classic “Sunny.” This is music that strikes the perfect balance of serious virtuosic playing and fun melodic improvised playing, all over grooves and feels that are in the pocket and feel good. That’s the short of it! Filipiak is a monster guitar player, but he also has that same talent when it comes to songwriting. Filipiak co-wrote three of the tracks with various members of the band, a new approach for the virtuosic guitarist. His melodies are catchy and incorporate sounds of jazz, funk, rock, soul, blues and of course, fusion. Using a warmly distorted Stratocaster sound, Filipiak gets his lines to sing as he builds his solos; never a dull moment with this guy! The band is killin’ too! 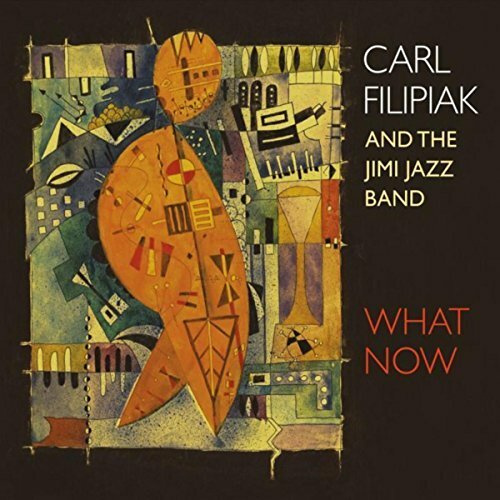 Carl Filipiak and the Jimi Jazz Band are pushing the rock/fusion genre forward with melodicism, creative songwriting and hip feels and grooves. As a player Filipiak’s guitar playing radiates knowledge and tempers playing with lyricism and density with space. This is rock/fusion on a different level, a stunning tapestry of jazz, rock, funk, Southern blues and guitar wizardry.